Ballon d’Or three finalists are known! Who will be the best European player? Franck Ribery voted player of the year in the Bundesliga! 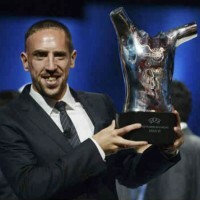 Franck Ribery named best player of Bundesliga! Jean-Pierre Papin won the Ballon d’Or in 1991. Today, the former striker feels that the winger Bayern Munich, Franck Ribery, has a good chance to receive this distinction. “JPP” recalled that the French international was “good all year” and that he “gained a lot of things” . Franck Ribery has triumphed in the Champions League , in the Bundesliga and German Cup with the German team. Jean-Pierre Papin added that the former OM player was “decisive” at all levels (goals / assists) and that premium, he “changed his way of being with the media”.